Our library is full of treasures. For example, we have 3 copies of the art magazine Verve. Launched in 1937, by French publisher Tériade, the magazine was focused on raising awareness of art to a new generation of painters and intellectuals. The reproductions are stunning and even after 80 years, they still retain their high-quality. 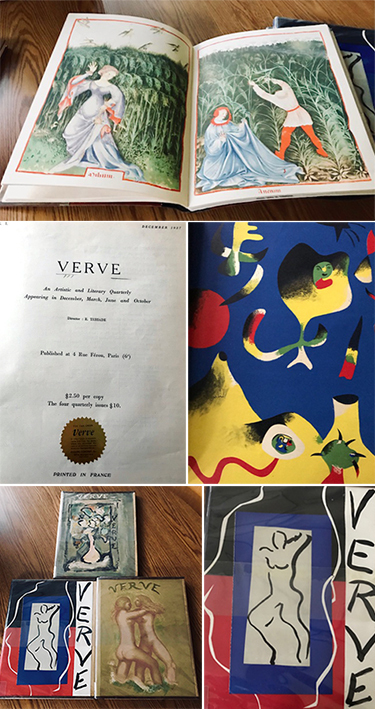 The magazine was published in both English and French with covers and illustrations by influential artists like Georges Braque, Marc Chagall, Vasily Kandinsky, Henri Matisse, and Pablo Picasso, with accompanied text written by Albert Camus, Ernest Hemingway, James Joyce, Andre Malraux, and Jean-Paul Sartre, to name a few. The magazine ran from 1937–1960 with 38 issues.